warning siren bellowed through the concrete bunker of a top-secret Naval facility where U.S. military engineers prepared to demonstrate a weapon for which there is little defense. Officials huddled at a video screen for a first look at a deadly new supergun that can fire a 25-pound projectile through seven steel plates and leave a 5-inch hole. The weapon is called a railgun and requires neither gunpowder nor explosive. It is powered by electromagnetic rails that accelerate a hardened projectile to staggering velocity—a battlefield meteorite with the power to one day transform military strategy, say supporters, and keep the U.S. ahead of advancing Russian and Chinese weaponry. In conventional guns, a bullet begins losing acceleration moments after the gunpowder ignites. 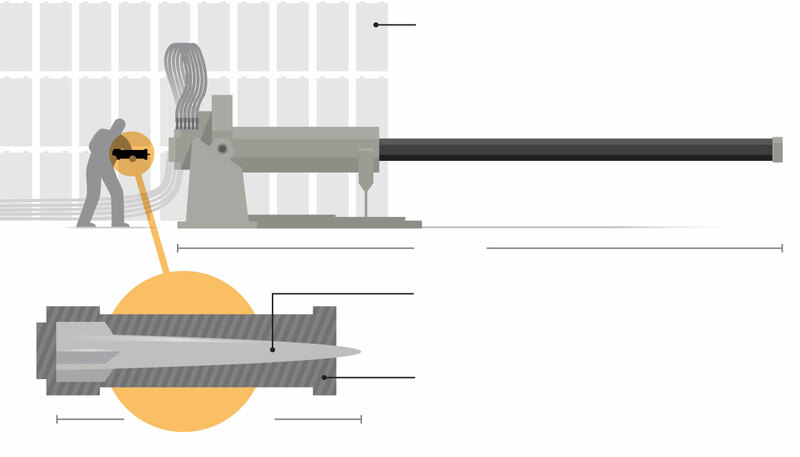 The railgun projectile gains more speed as it travels the length of a 32-foot barrel, exiting the muzzle at 4,500 miles an hour, or more than a mile a second. “This is going to change the way we fight,” said U.S. Navy Adm. Mat Winter, the head of the Office of Naval Research. The Navy developed the railgun as a potent offensive weapon to blow holes in enemy ships, destroy tanks and level terrorist camps. The weapon system has the attention of top Pentagon officials also interested in its potential to knock enemy missiles out of the sky more inexpensively and in greater numbers than current missile-defense systems—perhaps within a decade. The future challenge for the U.S. military, in broad terms, is maintaining a global reach with declining numbers of Navy ships and land forces. Growing expenses and fixed budgets make it more difficult to maintain large forces in the right places to deter aggression. Wires splay out the back of the railgun, which requires a power plant that generates 25 megawatts—enough electricity to power 18,750 homes. The siren blared again, and the weapon fired. The video replay was slowed so officials could see aluminum shavings ignite in a fireball and the projectile emerge from its protective shell. The Navy’s current 6-inch guns have a range of 15 miles. The 16-inch guns of mothballed World War II-era battleships could fire a distance of 24 miles and penetrate 30 feet of concrete. In contrast, the railgun has a range of 125 miles, officials said, and five times the impact. So it's got velocity. 16" shells also had mass. And mass counts for something. That's why a .45 ACP is more likely to put you down, and keep you down than a 9mm.